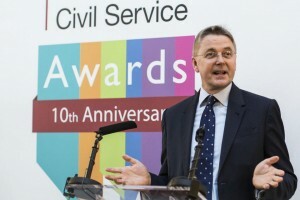 This year we are celebrating the 10th anniversary of the Civil Service Awards. The Awards were started by my predecessor, Gus O’Donnell, back in 2006, during which time there have been 136 winners, whose achievements range from working on the Northern Ireland peace process to dealing with the aftermath of the banking crisis. These awards have recognised the work of exemplary civil servants, up and down the country, from Glasgow to Plymouth, HMRC to DWP, and from the Olympics to Troubled Families. From the very first Cabinet Secretary’s award-winner Sorwar Ahmed, to last year’s winners in the Scotland Analysis Programme Team at HM Treasury, I am struck, but not surprised, by the professionalism, integrity and achievement of these hard-working teams. I am proud of what the Civil Service achieved over the last Parliament – successfully implementing the coalition commitments, while delivering billions of pounds of efficiency savings. Not only are the Awards well-deserved recognition for the individuals and teams who receive them, they help to spread best practice across the Civil Service, promoting greater efficiency in government and encouraging the spirit of innovation. This is your chance to nominate the individual or team that you believe has made a real difference to the delivery of public services. It is a real achievement to win a Civil Service Award – last year we had nearly 700 nominations from 79 different departments, agencies and government bodies – I hope that in our 10th anniversary year we achieve a new record. Any civil servant can nominate themselves or a colleague before 7 August 2015, so there is no reason not to enter. The shortlist will be announced in September on the Civil Service Awards website and in Civil Service World. The winners will be announced at a prestigious awards ceremony at Buckingham Palace in November 2015. I look forward to seeing some of you there!